It is no secret how much I adore bundt cakes. This Blueberry Bundt Cake with Lemon Glaze is another simple bundt cake recipe, and it is perfect for summer. The best way to describe this cake is that it is like a big, beautiful blueberry muffin—moist and full of blueberries. Have a slice for dessert, breakfast, or anytime. I hope you are enjoying your summer! I have been busy with vacation, guests, and my kids. I am baking less than I usually do, so I am not posting as often. I am also playing catch-up again with comments and with the blogs I follow. But I will catch up! Bundt cake filled with blueberries and topped with a lemon glaze. 1. Preheat oven to 350°.2. Combine the flour, baking powder, soda, and salt in a bowl and set aside. 3. In another bowl cream together the the butter and sugar until light and fluffy.4. Beat in the eggs one at a time, beating after adding each; beat in vanilla.5. Mix in the flour mixture alternating it with the sour cream; fold in the blueberries.6. 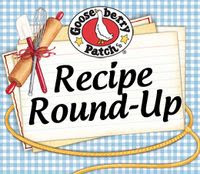 Spray or grease bundt pan and add batter; bake for 50 - 60 minutes or when a toothpick inserted into the center comes out clean.7. Allow cake to cool in the pan for 10 minutes, then remove from pan and allow to cool completely before adding glaze.8. To make glaze, add lemon juice a little bit at a time to the confectioners' sugar and mix until the desired consistency to pour over cake. Gorgeous bundt cake, Jill! I would totally eat it for breakfast :) Have a great day! You left out the measurement of the sour cream---a cup maybe? Yes--1 cup sour cream! It is correct now--thank you so much for letting me know! Blueberry bundt cake with lemon glaze looks delicious. Love to have a piece and start a day with it. You won the amazon gift card, I send you an e-mail. Send me details. I love bundt cakes and don't make them enough. This has all the ingredients I love and so simple to prepare. I will definitely try this. OOoh! I really need a bundt cpan, it makes everything look delicious! Ah... that's my favorite kind of cake! Especially one that has blueberries in it! Lovely presentation, Jill! What a gorgeous bundt cake! And you know that blueberry and lemon are a matchmade in heaven so this is just absolute perfection. Well done! 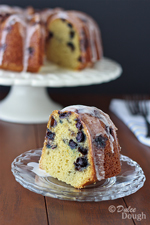 I love lemon and blueberry together, especially in this gorgeous bundt cake. This cake is calling my name. Thanks for sharing. Jill, this cake looks like a slice of heaven. I love blueberries. Yum! I need to get on the bundt cake wagon. It definitely looks moist! I wish I had a slice right now.